A big congratulations to everyone who has helped make our latest 0.13 release possible! This include all the contributors who have helped develop, code, build and of course our endless list of patient users who have been diligently testing our development snapshots. There has been so many improvements throughout the whole application. Many new features have been added and further performance and stability improvements in sketcher has been achieved over the year. The release notes give a snapshot of what has been achieved over the past year. I stand now still finding it unbelievable how much momentum we have gained over the past year. It isn't official but we may decide to back-port improvements and bug fixes for the relatively stable 0.13 release now. The future looks very promising, with numerous cool features in the works! The most anticipated being the Assembly Project. This is not to mention my render workbench and some other improvements that are hidden away in my git repos which are waiting further testing and refinement. 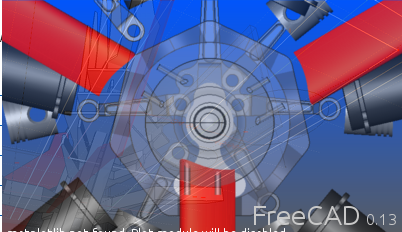 My personal motivation is to get someone to use my render module to produce a render of their design for the new FreeCAD splash screen!